The bird seems frozen. The wings are spread wide. 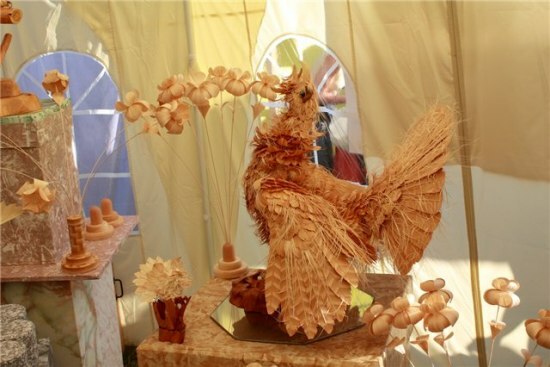 Looking so alive, it seems almost unbelievable that it is made of cembra pine wood chips. 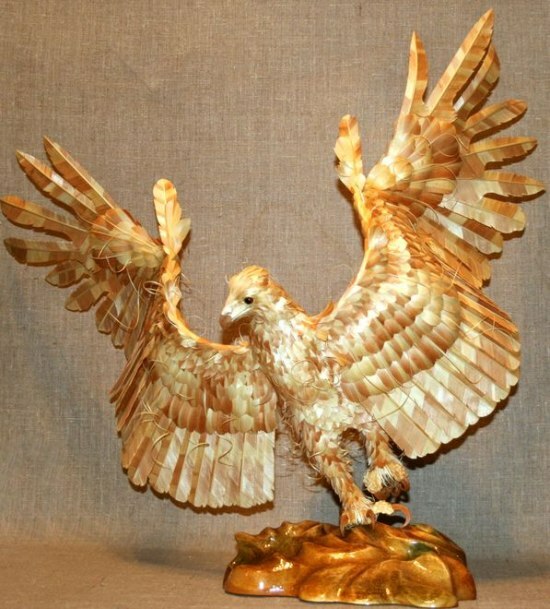 Artist Sergey Bobkov spent half a year to produce this wonderful eagle, working with practically no days off, 10 to 12 (and sometimes even 14) hours a day. No wonder! It took about 7 thousand feathers to make the plumage! 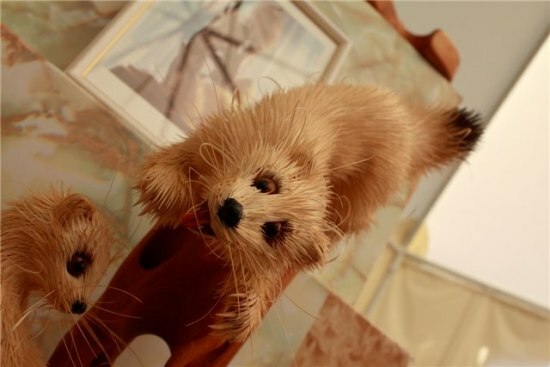 But it is definitely worth it – the result does not differ much from its living prototype. 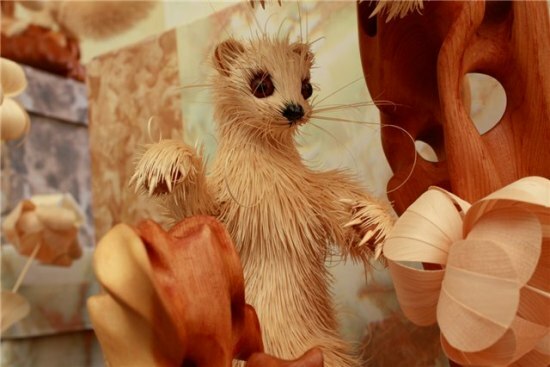 Artist’s collection consists of all kinds of birds and animals: life-size sables, squirrels, owls and so on. Before making a new “pet” Sergey Bobkov carefully studies its anatomy, habits and anything else that can help him better understand the chosen creature. And the technology itself is his invention. “It’s not too interesting to do what others can,” the artist says. “To create something out of nothing in a completely new way is far more inspiring”. 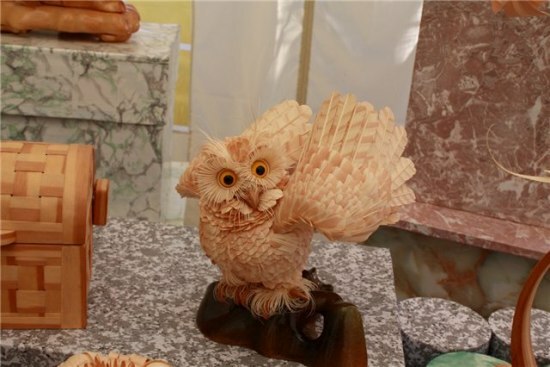 This talented secondary school teacher skillfully turns useless wood chips into genuine works of art. 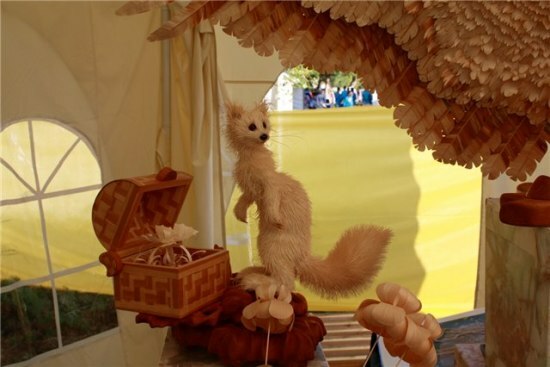 Birds with wooden feathers, squirrels and sables with coats made of environmentally safe material – all of them are copyrighted. Some time ago this remarkable citizen of Krasnoyarsk acquired a patent right for the new method of manufacture of art objects. 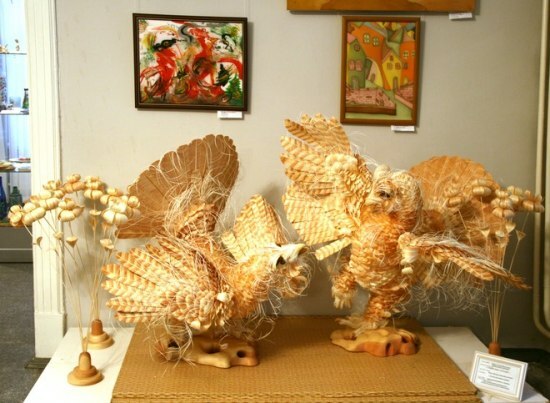 Such case is a true rarity in the field of arts and crafts, since it is really hard to invent something new here. 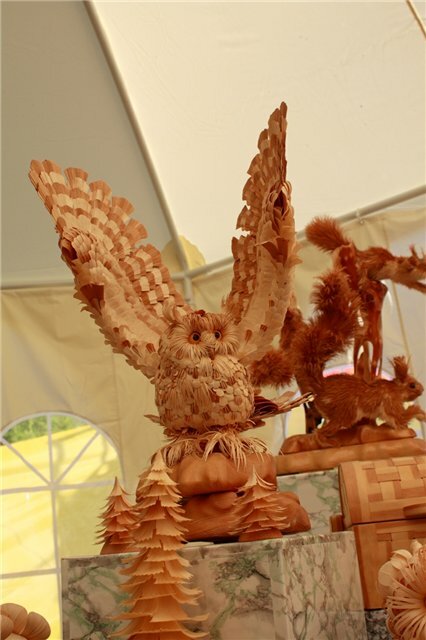 Sergey Bobkov gradually developed his own technique to prevent wood chips from crumbling; in order to do this, he puts them in water for several days. Most of the time the artist prefers to work with cembra pine; however, some elements are better made of willow or beech, for example. From a 2-3-inch long bar the artist makes 100 to 150 wood chips. Then the chips are carefully rolled to form a feather. Sergey says that wood chips are rather flexible material. Finished works of art do not need any special care; however, they do need to be protected from dust and direct sunlight. 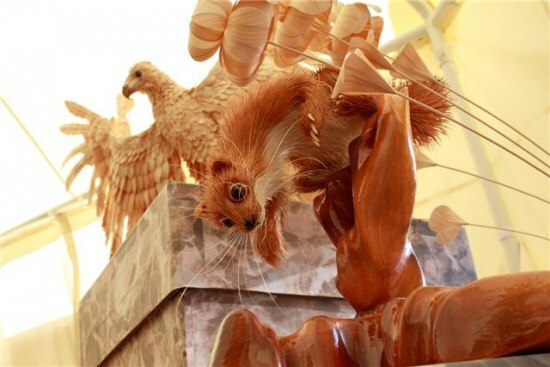 After one open air exhibition the artist had to shower his beloved pets; no harm was done to either one of them. 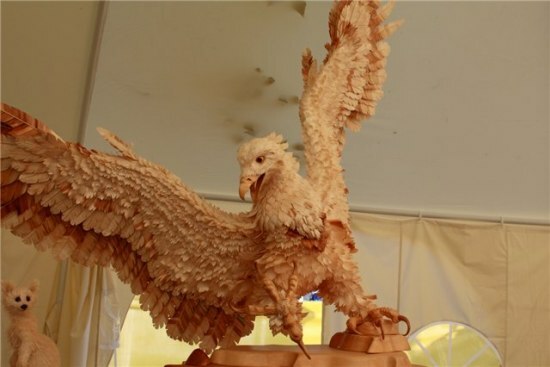 None of Sergey’s artworks are for sale; however, he was offered some five hundred thousand rubles (more than $17,000) for his Eagle. So taking the information on how long it took him to do the eagle, say that you paid the artist $9.00 an hour to do an eagle for you. So he works for 12 hours a day for six months, that would be $19,710 in labor costs alone! No thanks – they are really nice, but not that nice. For him it must truly be a labor of love. Let’s see you make one and then tell us it ain’t worth even $9.00 an hour! 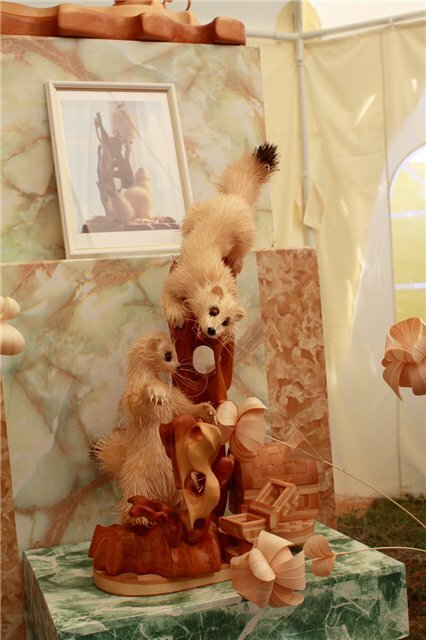 OMG he is doing us an injustice by not selling his work, i want one….. I am sure these creations are like his “friends”. No wonder he doesn’t want to part with them! Amazing gift, reflecting God our Creator! I carve for a hobby and have made some interesting items. I have been working for years (off and on)trying to perfect hair on animals and have been close but nothing like this artist. Very nice work and it is to be admired, not only for the art but for the time envolved. The time seems endless but the artist usually doesn’t notice because of the realization of his creation.